[S488] Lillian Hudson Lendrum, "unknown short title," e-mail to Margot Woodrough, March 12 2001. Death* 13 March 1812� He died on 13 March 1812 at Westmoreland County, VA, One record, Caroline County Chanery Suits says: He died in testate. Biography* � He served as a Surgeon's Mate on board the "Tempest" in Virginia State Navy. "History of Caroline Co., VA" p. 451 says he was a young Port Royal physician at the outbreak of the Revolution. He joined the Continental Navy and was Surgeon's Mate on both the "Tartar" and the "Tempest" two continental privateers. He practiced in Port Royal until 1812. 1. December 30, 1779 he was allowed 18" of brown sugar. September 9, 1779 he received coffee and sugar. December 10, 1779 he received sugar coffee and tea. a. In 1834 John Cannady of Fauquier Co., Va. states that Thomas Landrum was a surgeon's mate who stayed with the "Tempest" until it was abandoned by the crew when the enemy took command of the River (James) and finally the vessel. Thomas had been on board at least two years and ten months prior to the capture of the "Tempest". b. 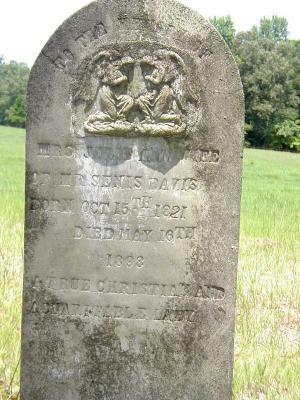 In 1834 Charles Hayden of King George Co., Va. stated that he knew Thomas Landrum and also the fact that he died in Westmoreland County, Va., and was the son of Parson Landrum of King George Co. Both Thomas Landrum and Higdon grew up in the same area. Thomas Landrum married after the war and lived in Leedstown in Westmoreland Co., Va.
c. William Stoke Jett (note that Thomas Lendrum's wife was named Margaret Stoake.) likewise made an affidavit in which he states that he was acquainted with Thomas Landrum, the son of Parson Lendrum of King Geo. Co., Va. He too says that after his marriage Thomas resided in Port Royal, Caroline Co. and practiced medicine. Later he moved to Westmoreland Co. where Jett was living. William Jett recalls the anecdote wherein Landrum was called upon to perform an amputation, his first, while in service on board the "Tempest". Following the Revolutionary War, Thomas married Margaret Stoake. It would be reasonable to assume that the wedding took place sometime between 1788 and 1790. If this date, and his presumed birthday are correct, then Thomas was probably in his mid thirties when he married. (Family stories indicate that Thomas Lendrum's wife was named Buckner but his will clearly calls her Margaret Stoake.) In fact, this name has persisted in the family up until the early 1900's, but to date no record is found of a connection with the Buckners. Perhaps the name belonged to either Margaret or Thomas' mother. Starting about 1834, Elizabeth Lendrum Collins, as a representative for the heirs, her brothers and sisters (presumably her mother now dead), started proceedings to secure the pension due as a result of the Act of Congress of July 5, 1832, granting pension rights to veterans or survivors or their heirs. Elizabeth had quite a job ahead of her and evidently it became necessary for her to enlist the aid of her congressman, J. Taliaferro, in an attempt to collect Thomas Lendrum's pension. Apparently there was some dispute as to when Thomas Lendrum actually terminated service, the Va. State Navy having been reduced in number prior to the close of the war. It was initially presumed that Thomas was relieved of duty at this time ________. However, it soon became apparent that two ships were retained in service past the date of reduction, these being the "Tempest" and the "Tattler". There are three affidavits in Thomas Lendrum's "half-pay" file which state that he was on board the "Tempest" as Surgeon's Mate. That being the case, J. Taliaferro was able to use the following facts from a similar case to cause the pension office to grant a pension, which allowed for Lendrum's service from the date of the ship's capture. The Captain of the Tempest was named Markham and he was made prisoner when his ship was captured in Hampton Rhodes. His heirs filed suit in the Virginia Court of Appeals for half-pay and won. Taliaferro requested that the war department grant the same right to Thomas Lendrum, since it was proved that he, too, served on the vessel until it's capture and so should be entitled to the same rights as the captain. In May of 1835, Lucy E. Lendrum, the daughter of Thomas, and sister of Elizabeth, acted as attorney-in-fact for Harriet E. Lendrum, Thomas W. Lendrum, John B. Lendrum and Lucy E. Lendrum in granting power of attorney to the estate administrator, Mrs. Elizabeth W. Collins. In fact the estate did succeed and on May 9, 1838, received a total of $2529.74 for 27 years and 264 days half-pay pension based on the rate of $91.25 per year. Presumably, the heirs used their hard earned pension to support themselves, and evidently it was a greatly needed pension for their support, for Mr. Taliaferro, in an effort to speed up the proceedings, refers to the needy, unmarried heirs. One wonders what part John B. Lendrum, who was at this time, far away in Kentucky, received. It is possible that he and his brother, Warren T. Lendrum, forfeited their rights to the pension in favor to their widowed and unmarried sisters. Having won the initial battle for the "half-pay" pension, and presumably having exhausted the funds received, Elizabeth Collins again became active in the pension care in 1845. She reopened the issue by requesting that half-pay be allowed from Nov. 30, 1781, the date on which Thomas Lendrum terminated service (?) until April 22, 1783, the date on which the original pension had commenced. She was successful, as shown by a letter dated Sept. 17, 1845, from the Pension Office in Washington which allowed the heirs an additional 91.25 per year for the extra 18 months, a total of $127.00. The matter was still of interest to someone in 1854, for one Thomas C. Peek, of Hampton, Elizabeth County, Va. whose relationship is yet unknown, wrote to the Pension Office in Washington asking how much half-pay had been allowed for Thomas Lendrum, when and to whom it had been allowed. Ancestry.com. California Death Index, 1940-1997. [database online] Provo, UT: Ancestry.com, 2000. Original electronic data: State of California. California Death Index, 1940-1997. Sacramento, CA: State of California Department of Health Services, Center for Health Statistics, 19--. Personal Information What to do next? [S334] Unknown subject unknown repository. Great grandmother of Jerry Floyd of Jacksonville. [S491] Jerry Floyd, "Jerry Floyd," e-mail to MVW, June 2001. [S330] Unknown subject unknown repository. [S498] Wiregrass Genealogy Group, Floyd Cemetery. Received this name from Beck Nagle through e-mail in 9-01. [S497] Becky Nagle, "Holland Correspondence," e-mail to Margot Woodrough, 2001. [S405] , Handwritten Notes MVW file.